Photo by Paul Looney – The Ocean Township High School girls cross country team won four of its first seven dual meets. 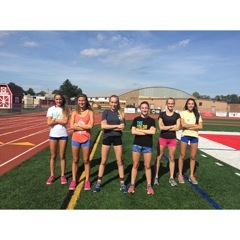 From left to right are Emily Dorony, Morgan Rue, Michela Cholak, Erica DiNapoli, Sarah Etter and Bella Downs. Ocean Township High School girls cross country coach Paul Looney said at the start of the season he was hopeful for big things from Michela Cholak. Cholak has delivered for the Spartans, pacing the team to wins in four of its first seven dual meets. She ran the 12th-fastest time in school history at hilly Holmdel Park. She has run the second-best time in school annals at Thompson Park in Jamesburg. And she has run 19 minutes at Ocean County Park in Lakewood. Cholak finished first in five of her first seven dual meets. She also competes in the 800-meter run, 4×400 and the 400. Senior Erica DiNapoli is the team’s second runner. Another swift Spartan is sophomore Sarah Etter, who is on the school’s top 25 list at Holmdel Park. Junior Gabby Latzsch and freshmen Emily Dorony and Bella Downs have also impressed. Senior Morgan Rue has been slowed by a back injury, but hopes to return to action later this season. “She is pushing toward the big meet season,” Looney said. The Spartans will compete in the Monmouth County Championships on Oct. 20 at Holmdel Park. Early in November, Ocean will step to the starting line in the NJSIAA Central Jersey Group III Championships at Thompson Park. The Spartans have also received contributions from seniors Erin Foster, Melissa Nieves, Karli Hill, Remi Cros and Bailey McGovern, sophomore Emily Nelson and freshman Elizabeth Appoy. Ocean’s home course is Holmdel Park where it also trains. Looney, 52, often trains with his team. Looney competes on the road racing circuit. Some years back, Looney competed in the New York City Marathon. Looney is a 1981 graduate of St. Rose where he competed in track. He made the University of South Carolina men’s cross country team as a walk-on. Looney is an Ocean assistant track and field coach in the spring, guiding girls and boys.